Danish veteran Schodt recently showcased his acclaimed debut artist album on Silk Royal, as well as additional single releases on the same label. His last appearence on Silk Sofa was with his "Moviola" EP, and now he's ready with "Sunset In Tokyo", which includes three inspiring downtempo cuts. "Waiting" includes several well-crafted and soothing melodies, and a unique breakbeat creates the foundation of the groove. The piano line and intermittent vocal effects provide additional texture to the intriguing soundscape. 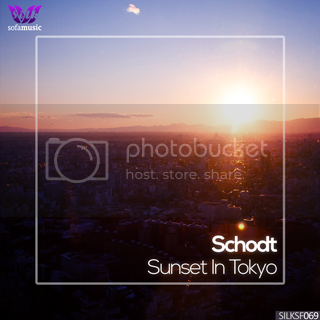 The title track, "Sunset In Tokyo", starts out with mesmerizing bell melodies, and an enjoyable soundscape is quickly established. Smooth percussion elements and sweeping sound effects also help captivate the listener. Lastly, "Yours Truly" includes calm and blissful melodies, accompanied by lush percussion lines, high piano notes, and intriguing string layers.